Kayak.com introduced a new term called Hacker Fares, along with their ‘nonstop’, ‘1 stop’ options, that allows you to book two one-way flights with separate airlines and separate tickets. The whole idea is to save money by choosing one-way flights on different airlines. You can always deactivate this option by unchecking the “Show results that require two separate bookings” option on the left navigation/option block. We gave this a try by searching for flights from Seattle to Los Angeles in the first week of October. 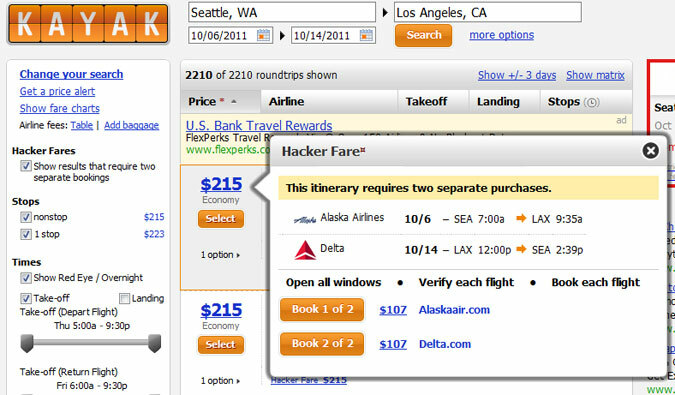 Kayak listed flights with the top results as ‘Hacker Fares’. Now we see that we have one-way from Alaska Airlines ($107) and return flight on Delta ($107). Of course, you have to book these individual flights, but the upside to this is that it saves you some moolah.